Hipchickindc (aka Suzanne Des Marais) is an associate broker with The Bediz Group, LLC at Keller Williams Capital Properties . Unless specifically noted, neither she nor the company that she is affiliated with represented any of the parties or were directly involved in the transaction reported below. Unless otherwise noted, the source of information is Metropolitan Regional Information Systems (MRIS), which is the local multiple listing system and/or Real Estate Business Intelligence (RBI). Information is deemed reliable but not guaranteed. List Price at Contract: $245,000. Settled Price per Square Foot: $512. Note that this is not the subject property, but another unit in the building was a GDoN post in November 2015: here. This recent sale did not start out as a GDoN (Good Deal or Not) post, however, I stumbled upon it while following up on another unit that was a GDoN in the same building. It seemed like an opportunity to write about a rare bird in DC…the foreclosure sale. By the time a property is listed as a foreclosure sale on the multiple listing service, the original owner is completely out and the bank that holds the mortgage has taken ownership (as opposed to a short sale, where the owner is still in the picture). The important thing to note is that you’re not dealing with a person on the other side of a sale like this, but with a corporation. Subsequently, the transaction is very process and numbers driven. Things do not happen quickly. Asset managers at banks rely on something called a Broker Price Opinion or BPO to determine the list price of the REO (real estate owned by the bank). The asset manager may be in another part of the country and will likely have never seen the property. The property will be physically managed by shutting down all utilities and secured, the listing will go on the multiple listing system, and buyers have the opportunity to submit an offer through an online site. Oh, and banks have weird rules. It notes in the remarks to agents on this listing “Buyer responsible for utilities at inspection” (meaning the buyer has to pay to start accounts to set up utilities on a property they don’t own in order to do an inspection), and in this case there are additional instructions with regard to the water, “only air compression test allowed”. Yes, but was it a good deal? The subject property is a 430 square foot 1 bedroom basement unit that settled at $512. per square foot. 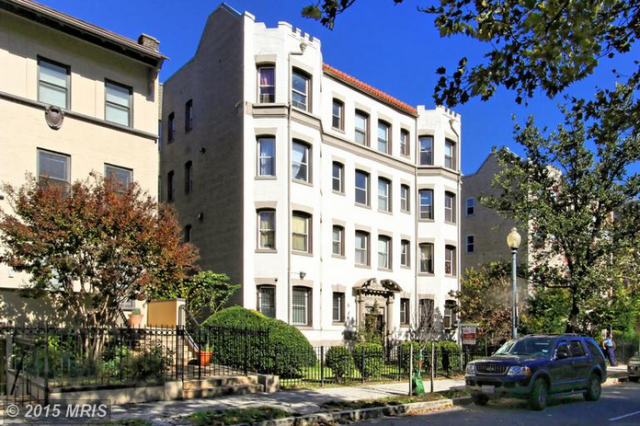 The next most recent listing to sell in the building is the one linked above from the GDoN post, of a third floor 800 square foot 2 bedroom unit that settled in December 2015 for $406,500. or at $508. per square foot. In case you’re curious about active listings in DC that are potential short sales or foreclosures, you can see the current list here. The listing agent for this sale was David Sweeney with Owners.com. Kathi Higdon-Kershaw with Evers & Company Real Estate Inc. represented the Buyer.